Ammunition is spread all around, making it almost impossible to move without risking your own life. It is a place that people would normally avoid, but wolves seem to love it: military zones. On July 8th BIORAMA organised, together with the Allentsteig military, a tour to visit the exclusive wolf-area in the Austrian military zone. The European Wilderness Society joined the tour, after an earlier visit on July 15th with US-Wilderness expert Garry Oye visited to the former German military zone Königsbrücker Heide, accompanied by its superintendant Jürgen Stein. Comparing the latest information from Königsbrücker Heide Wilderness and Allentsteig, we can see some interesting similarities. The Allentsteig wolves consume annually approximately 13,500 kg of meat. Divided by the area, this is similar to 3 adult deer per 100 hectares. As the deer density for Allentsteig and Königsbrücker Heid is estimated between 20-30 deer per 100 hectares, this means that the wolf takes 10-15% of the deer population. Both wolfpacks exist of approximately 10 wolves, however this number is flexible as wolves join and leave packs regularly. The no-go zones for general public create a wilderness zone with limited to none human interference and a suitable home for the wolf. The former military training ground Königsbrücker in Saxony was actively used during the 20th century, from 1907 until 1992. At the end of WW II, the Sovjet soldiers took the military zone over from the German army. After local protests and many discussions, the Sovjets left Königsbrücker in 1992, and since then it was virtually a no-go zone. In 85 years, the area became scattered with millions of ammunition pieces. As human access was restricted, nature was left untouched and within a few year the former military zone was transformed into a nature reserve. In April 2011 a camera trap caught the first wolf in Königsbrücker Heide. Originating from the Polish wolf-populations, it was only a matter of time before wolfpacks would settle here. Currently there are estimated 18 wolfpacks in the Saxony and Brandenburg area of eastern Germany, including approximately 10 wolves in Königsbrücker Heide. The Königsbrücker Heide Wilderness core zone stretches beyond the gravel roads. The Austrian army still has an active military training zone in Allentsteig, founded in 1938 by Germany in preparation of WW II. The training grounds of 15,600 hectares is used annually by 30.000 soldiers. As in Germany, the area is filled with so-called ‘blindgängers’, unexploded ammunition, and is therefore a no-go zone for the general public. Due to its remoteness from urbanised areas in the Waldviertel, the Allentsteig training grounds has a double role as natural area for a wide variety of flora and fauna. The first wolf in Waldviertel was caught on camera in 2015, followed by a confirmation of a wolf-sighting in Allentsteig in June 2015. In January 2016, two wolves were spotted, and by August 2016 the wolf-pair expanded to a family of 7. And it does not stop there! Last week, a press-release announced that 6 young wolves were spotted. The estimates are that a few wolves have left the area, leaving approximately 10 wolves in Allentsteig. The German wolf population grew to over 45 wolf packs throughout Germany within 20 years, and although Allentsteig has ongoing military activities, this news looks promising for the first settled wolves in Austria. 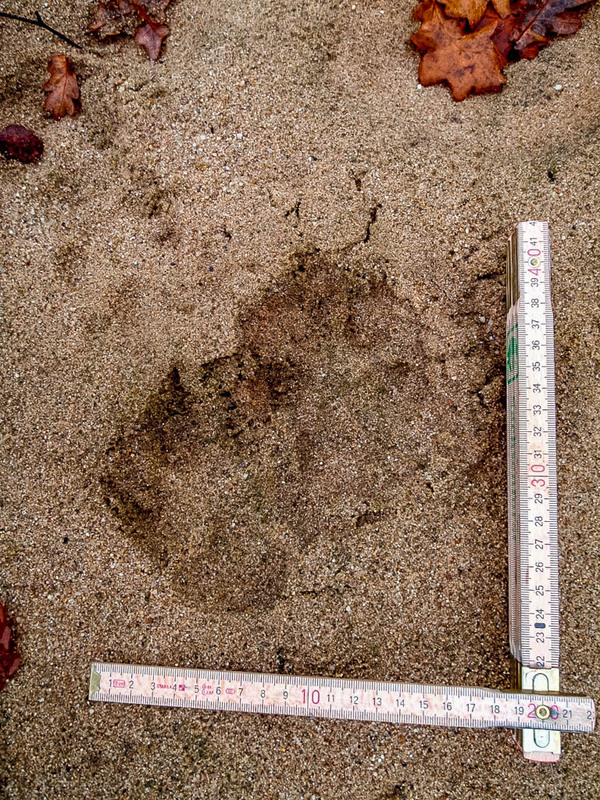 Wolf tracks along sand road in Königsbrücker Heide.